Billy Owens was a versatile power forward, the type of player who could carry a team on his back for a series of games. He had the size, strength, and ball handling abilities to do it all. Owens could bring the ball up the court, set up a teammate, pull down the rebound, post up down low and shoot from outside. Owens was one of the most highly recruited high school players in the country, having led Carlisle High School to three straight Pennsylvania state championships. He came to Syracuse following his brother Michael who was a star running back on the football team. As a freshman at Syracuse, he joined a team loaded with veteran talent, yet he immediately started. Owens showed a commitment to teamwork, deferring to the upper classmen, yet still managing to score 13 points a game. He made his presence particularly memorable in the big Georgetown rivalry game, where he was fouled as time expired and Syracuse down by two points. Owens calmly went to the free throw line, made both, and Syracuse won in overtime before (what was then) a record NCAA crowd. Owens shared the rebounding responsibilities with Derrick Coleman his first two years. After Coleman and Stephen Thompson graduated in 1990, Owens finally became the focus of the Syracuse offense. And did he ever deliver. Owens became the first player under coach Jim Boeheim to score 20+ points per game (easily eclipsing that mark at 23.2 ppg). He scored 30+ points 8 times, and 10 times he had 15 or more rebounds in a game. He lead Syracuse to a 26-4 regular season record, reaching #6 in the country. For much of the season he carried the team on his shoulders, as the team had an inexperienced backcourt. A funny thing happened in the post season. Syracuse shockingly lost to Villanova in the first round of the Big East Tournament (though Owens had a big game with 22 rebounds). Then, in the NCAA tournament, as a #2 seed, Syracuse was upset by the Richmond Spiders, in one of the biggest upsets in NCAA tournament history. Owens was on the Big East first team his sophomore and junior seasons, and was a first team All American and the Big East Player of the Year his junior season. Owens, having accomplished all he could in terms of skill development (though having never accomplished significant success with NCAA tournament wins) decided to forego his senior season and go to the NBA. Owens was the 3rd pick in the 1991 draft, taken by the Sacramento Kings. He would be traded in November to Golden State for Mitch Richmond, Les Jepsen and a 1995 2nd round draft pick. Owens would have a solid NBA career, though not a spectacular one due to reoccurring knee injuries. He would play ten seasons, with Golden State, Sacramento, Miami, Seattle, Philadelphia, and Detroit. In 1994 he would be traded by Golden State to Miami for former Orangemen Rony Seikaly. 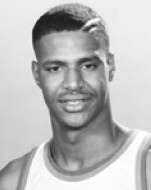 Owens was named to the Syracuse All-Century team in 2000. He had his uniform retired by Syracuse in 2008.